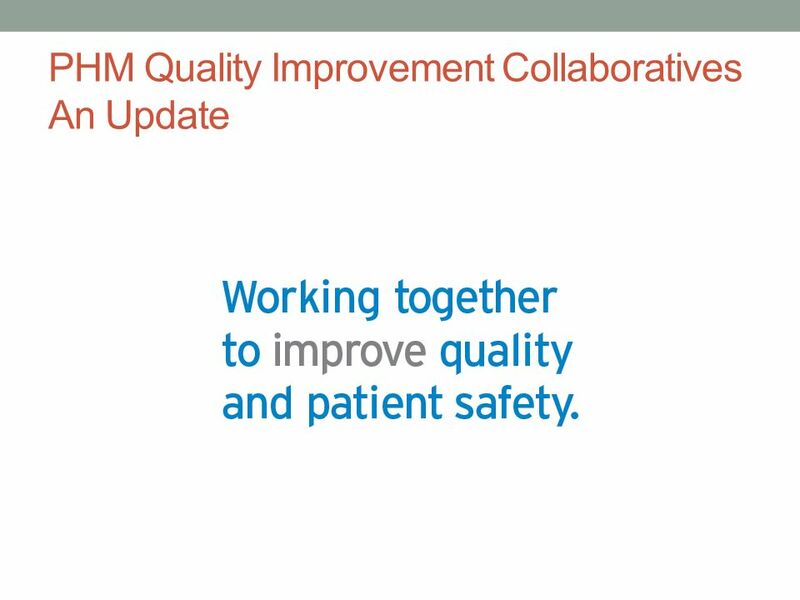 PHM Quality Improvement Collaboratives An Update. 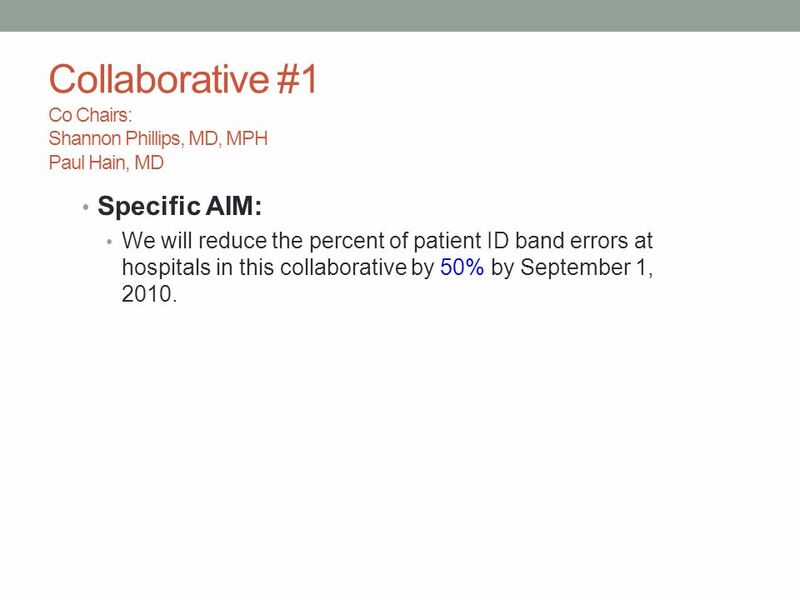 2 Collaborative #1 Co Chairs: Shannon Phillips, MD, MPH Paul Hain, MD Specific AIM: We will reduce the percent of patient ID band errors at hospitals in this collaborative by 50% by September 1, 2010. 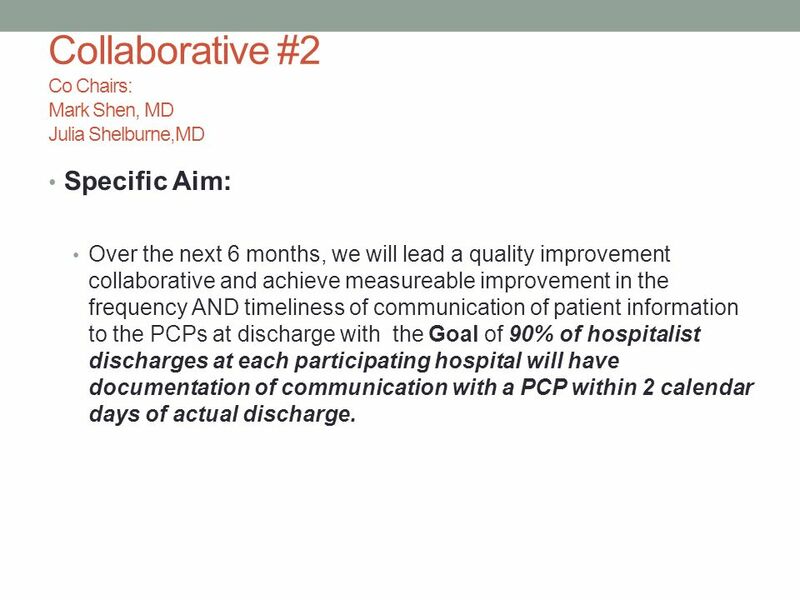 6 Collaborative #2 Co Chairs: Mark Shen, MD Julia Shelburne,MD Specific Aim: Over the next 6 months, we will lead a quality improvement collaborative and achieve measureable improvement in the frequency AND timeliness of communication of patient information to the PCPs at discharge with the Goal of 90% of hospitalist discharges at each participating hospital will have documentation of communication with a PCP within 2 calendar days of actual discharge. 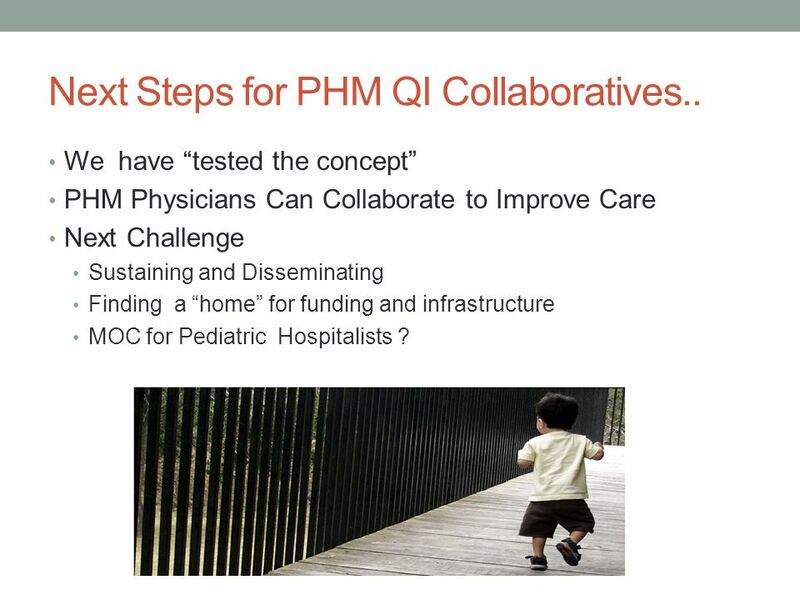 15 Next Steps for PHM QI Collaboratives.. We have tested the concept PHM Physicians Can Collaborate to Improve Care Next Challenge Sustaining and Disseminating Finding a home for funding and infrastructure MOC for Pediatric Hospitalists ? 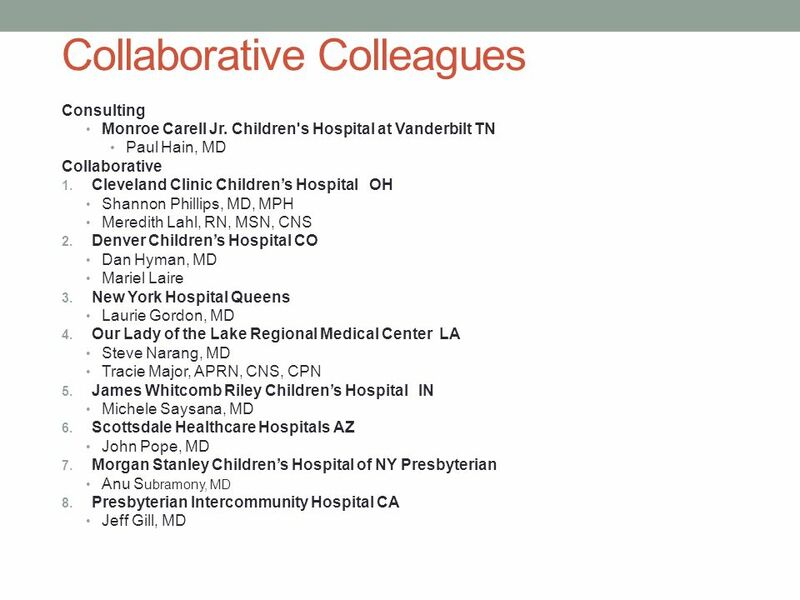 Download ppt "PHM Quality Improvement Collaboratives An Update." 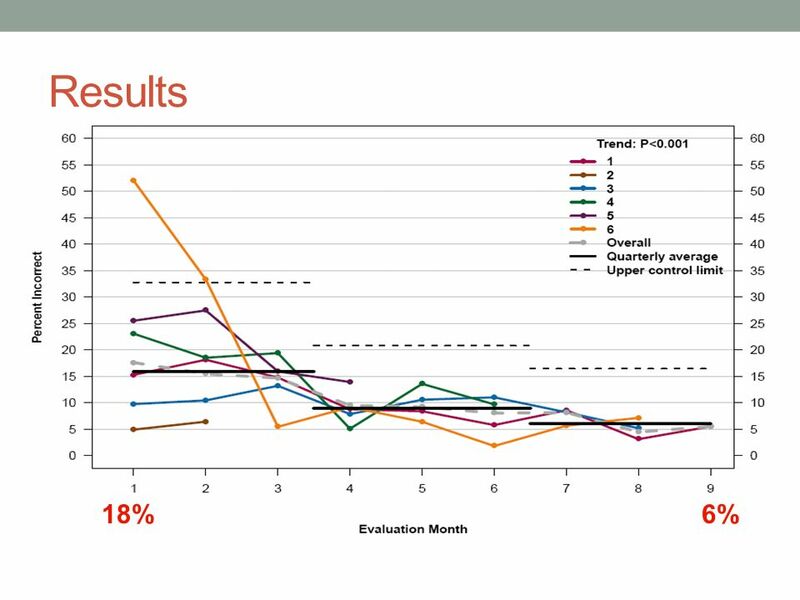 Seize Control: Improving Epilepsy Care Media Telebriefing – Results and Implications from New Patient Survey December 3, 2007. 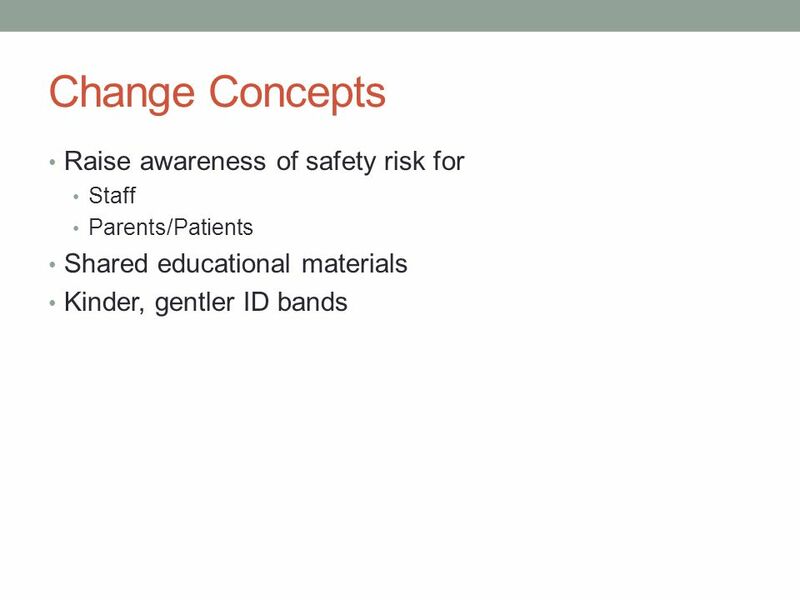 From the Frontline of Care Improvement – How to do it Right Webinar #3 - Diabetes Care Improvement Series Chris Cammisa, MD. Medical Consultant, California. 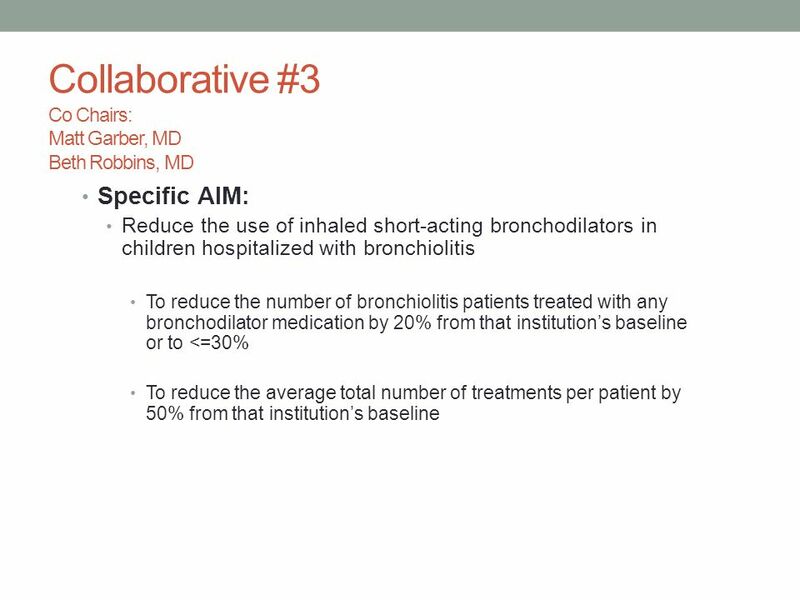 Building an Integrated System for Personalizing Care Tim Johnson, MD Spring, 2014. I have no relevant financial relationships with the manufacturers of any commercial products and/or provider of commercial services discussed in this CME. Created by Susan Neal. On the next slide, click and try to figure out what state is displayed. To find out the answer, click again. 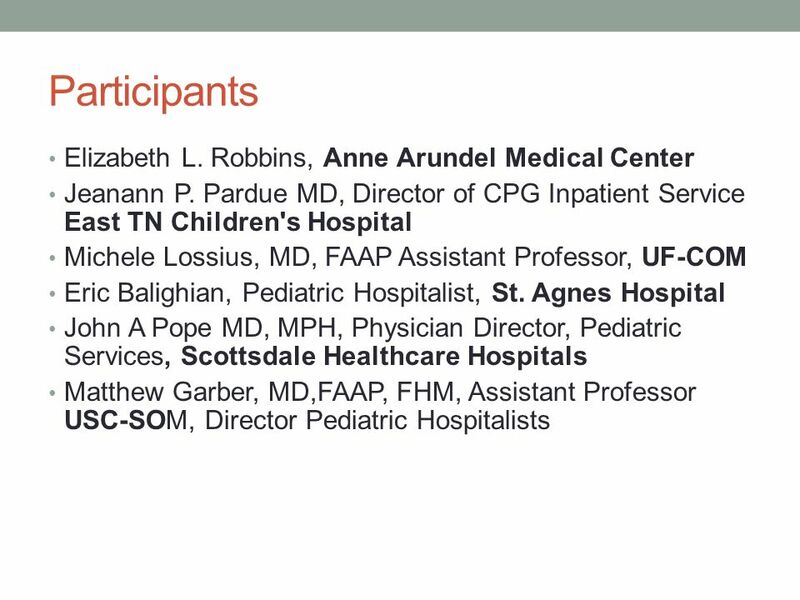 Quality Improvement Basics and B-QIP: Real Life Application Susan Walley, MD Division of Pediatric Hospital Medicine August 15, 2013. San Diego University of Best Practices Update Right Care Initiative Leadership Summitt Berkeley, CA Scott Flinn MD, Chair Anthony DeMaria MD, Co-Chair. 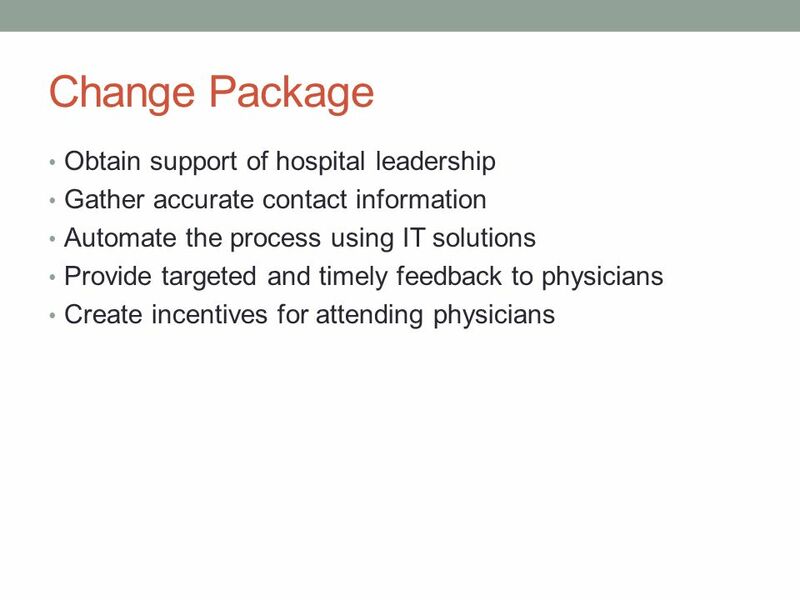 1 California Quality Collaborative Accelerating Improvement of the Commercial Delivery System Neil A. Solomon, MD Clinical Director, CQC. 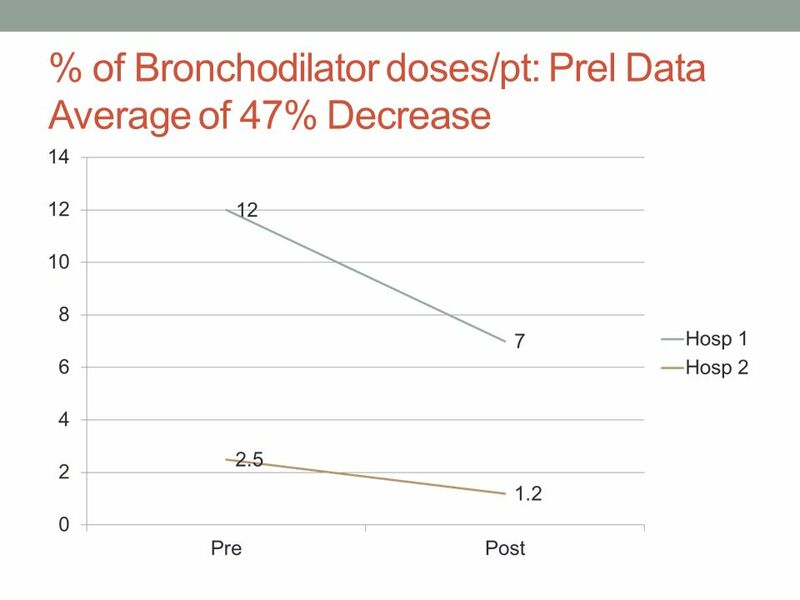 Eric D. Peterson, MD, MPH Professor of Medicine, Vice Chair for Quality Duke University Medical Center Associate Director & Director of CV Research Duke. 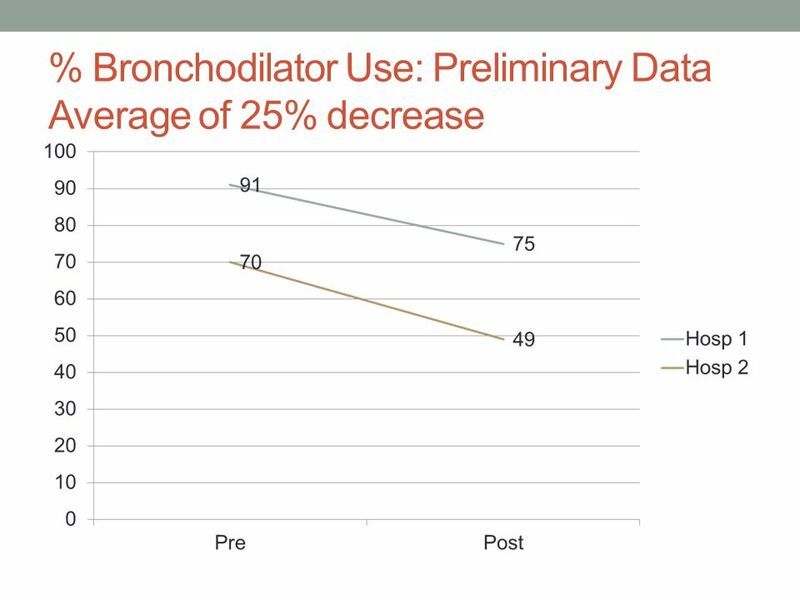 Access to Care in The Medicaid Program Andrew B. Bindman, MD Professor of Medicine, Health Policy, Epidemiology & Biostatistics University of California. Jeff Reece, RN, MSN, MBA Chief Executive Office Chesterfield General Hospital. Future plans NMCN CEN 29 September 2010 Glasgow. Future projects as prioritised by Steering and Working groups: 1.Pathway of care: -Implementation -Audit. 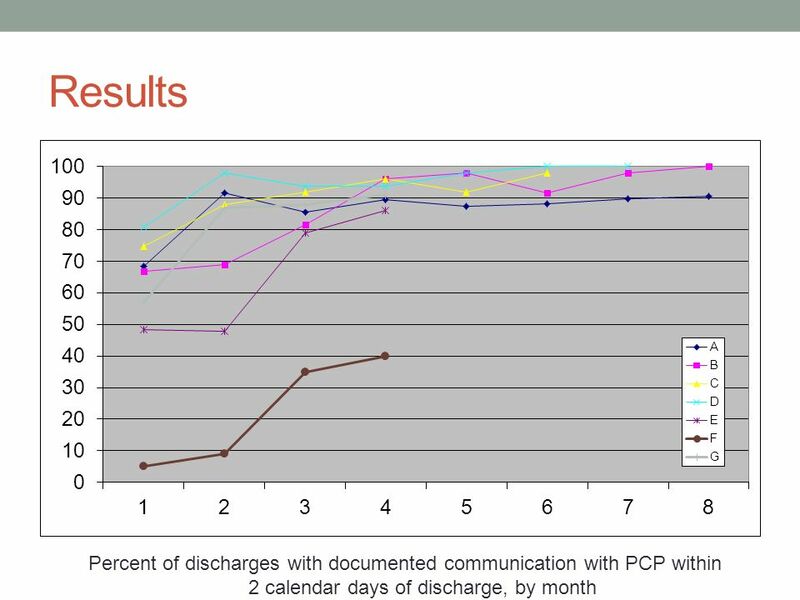 Engaged leadership Data-driven improvement EmpanelmentTeam-based care Patient-team partnership Population management Continuity of care. Private Initiatives to Expand Coverage Citizens’ Health Care Working Group Public Meeting and Hearing Testimony of Anthony R. Tersigni, Ed.D., FACHE President. 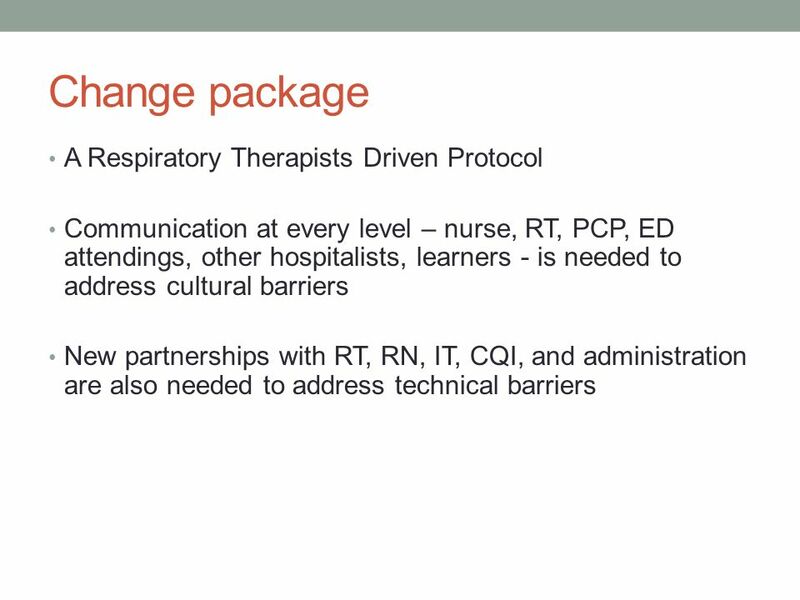 Improving care transitions at Harborview Medical Center Frederick M. Chen, MD, MPH Chief of Family Medicine Associate Professor, University of Washington. 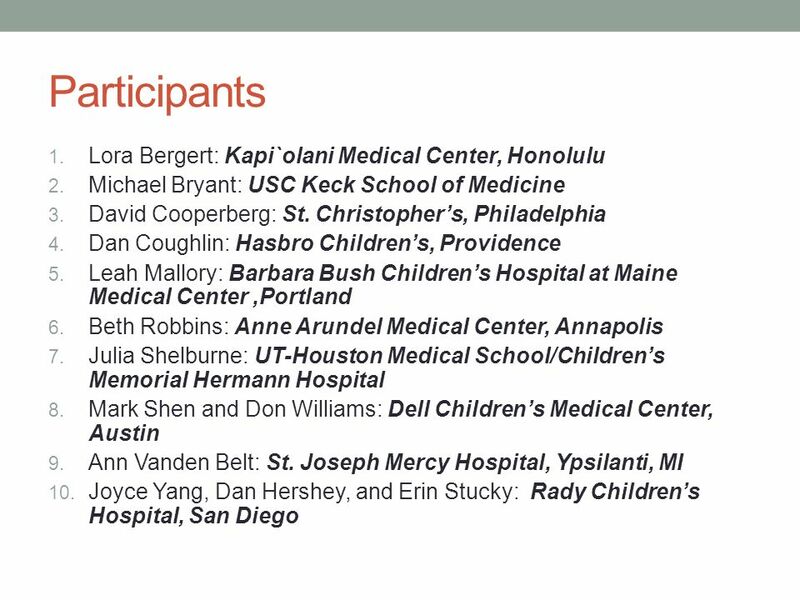 P EDIATRIC H OSPITALISTS C OLLABORATE TO I MPROVE D ISCHARGE C OMMUNICATION Mark Shen, MD UT Southwestern Austin Pediatrics Dell Children’s Medical Center.